One of my favorite high fashion style wedding images ever. This image was created inside The Fox Hollow Inn catering venue in Woodbury, NY. This amazing place is owned by the same folks that own a number of other catering halls including Chateau Briand in Westbury, New York, Westbury Manor in Westbury, NY and The Watermill Inn in Smithtown, New York. I have worked extensively at all of these venues during my 30 plus years as a Long Island wedding photographer. This newly constructed room at The Fox Hollow Inn features two sculptured walls with overhead down lighting as you see in this picture. 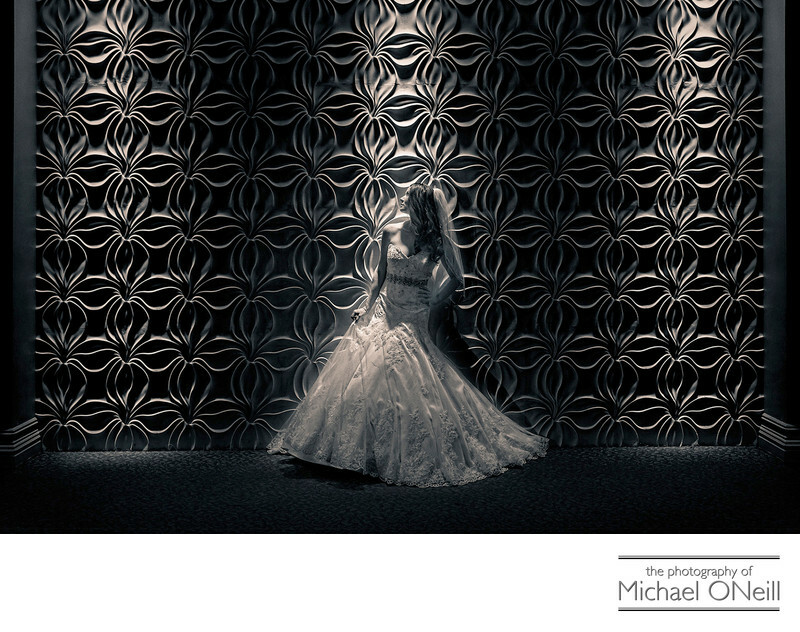 The modern style of this room design lends itself perfectly to creating truly contemporary wedding photography.This image has earned many awards including a best-in-show award in the Professional Photographers of Greater New York image competition, a Court of Honor Award at Photo Northeast (The annual joint state conference of the Professional Photographers Society of New York State and Professional Photographers Association of New Jersey) and an Accolade of Excellence from WPPI (Wedding and Portrait Photographers International) in their annual Print, Album and filmmaking competition held every year in Las Vegas, NV.If you are planning a Long Island wedding at The Fox Hollow Inn, Chateau Briand, Westbury Manor or The Watermill Inn you should give me a call to discuss your photography needs and desires for your wedding day. I would love to meet with you and work with you on your big day.